What is the hardest bamboo floor we can buy? Strand woven is the hardest bamboo flooring you can buy. Premium Green Strand Woven bamboo has a 3000 PSI Janka rating. That is nearly double the rating of a standard solid bamboo floor. In the flooring industry, the Janka hardness rating is an official test in which a steel ball bearing is pressed into the surface of a wood flooring species. At a specific amount of pressure, a given species will indent. The more pressure the surface was able to withstand prior to denting, the higher the Janka rating. Do I have to use an underlayment under my laminate floor? If your laminate floor does not already have an underlay pre-attached you will need to purchase an underlayment to lay on the subfloor prior to installing the laminate flooring. 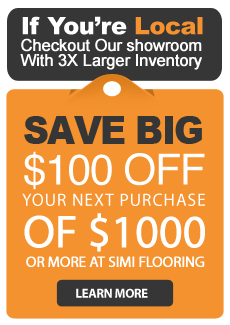 All manufacturers' limited warranties will apply to products purchased through Simi Flooring. You can find details about each manufacturer's warranty on their official website or contact us to receive a copy of the manufacturer's limited warranty details free of charge. Do you also install flooring? We install everything we sell and, as your local showroom, stand behind our work with some of the best guarantees in the business. Reach out to the store staff, and a local showroom representative will contact you to schedule a visit to your home to review your installation options in detail. Residential carpet warranties will require a minimum of one professional cleaning every 18 months using products, equipment or systems that carry the CRI SOA (Carpet & Rug Institute's Seal of Approval). Depending on the level of traffic, family size, soil conditions adjacent to the home and other circumstances, more frequent cleanings may be advisable. Why buy a laminate floor instead of the real thing? Laminate's real claim to fame is its durability and ease of maintenance. Since most come with an aluminum-oxide wearlayer — one of the hardest substances known to man — it can stand up to kids, pets, traffic and more. Plus, the great thing about laminate flooring is not only does it closely emulate other hard surfaces, but it does it at a fraction of the cost and with no natural material drawbacks. I know that water is a concern for laminate flooring. Does this mean that I can't put laminate flooring in my bathroom? Laminate flooring can be used in virtually any room of the house. Although it's true that laminate floors do have some sensitivity to excessive moisture, if you plan on using laminate flooring in your bathroom, you'll need to take special precautions to prevent water from contacting the core material of the flooring, such as sealing around the perimeter of the floor with caulk or sealant. Be sure to discuss the installation procedure and care and maintenance of your laminate floor with your retail flooring specialist. Sweep, dust, or vacuum the floor regularly with the hard floor attachment (not the beater bar) to prevent accumulation of dirt and grit that can scratch or dull the floor finish. For tough spots, such as oil, paint, markers, lipstick, ink, or tar, use acetone/nail polish remover on a clean white cloth, then wipe the area with a damp cloth to remove any remaining residue. Periodically clean the floor with cleaning products made specifically for laminate floor care. For spots such as candle wax or chewing gum, harden the spot with ice and then gently scrape with a plastic scraper, such as a credit card. Be careful not to scratch the flooring surface. Wipe clean with a damp cloth. A more frequent dust-mopping or vacuuming schedule may be required in very sandy areas such as a beach home. Most types of tiles are made from clay and a mixture of other materials and then fired at very high temperatures to create a dense, durable surface. Ceramic tiles, or non-porcelain tiles, are usually made from white or red clay, are fired in a kiln and coated in a glaze that gives it color. They work for both floor and wall applications, but are usually softer and easier to cut than porcelain tile, carry a PEI rating of 0 to 3, and support light to medium traffic. Ceramic tiles are also more prone to chipping, scratches and wear than porcelain tiles. Porcelain tiles are usually made from porcelain clays and are fired at much higher temperatures, which make them even more dense and durable than non-porcelain tiles. True porcelain tiles have a water absorption rate of less than 0.5 percent, making them frost resistant. Some porcelain tiles are glazed with color like ceramic tiles. Other porcelain tiles are "full body", which means the tile carries its color throughout its entire thickness making them impervious to wear and appropriate for high traffic areas. Most porcelain tiles today have a PEI rating of 5, and are suitable for heavy-duty traffic. Click the “Create Account” link at the very top of the store on any page. You may create an account automatically using your Facebook profile by hitting the blue “Connect” button. Alternatively, you may fill out the blank fields to create a stand-alone account. Click the “Your Account” link at the very top of the store on any page to access the “Account Profile” page. Click the “Edit” button to make changes. Fill in the “Email Address” or “New Password” field with your preferred address or password. How can I contact your site about a potentially fraudulent website or email? Click the “Customer Service” tab on the store’s top navigation bar. How can I cancel my account ? Click the “Contact Us” link under "Company Info." Why won’t my browser work with your website? The Web is an ever-changing landscape, so browsers need regular updates to support these changes. Fix the problem by browsing with a modern and popular browser that you’ve updated with the latest software and security patches. In rare cases, an outdated operating system can cause the same problem. Fix this problem by using a device with a modern operating system that you’ve updated with the latest software and security patches. Does my computer need to accept cookies to shop on your site? What is the best way to find what I need? Find what you need by browsing or searching. Browse using the navigation tabs close to the top of any page. The search bar is located at the top of any page. In either case, filter your results by configuring the smart filtering options to the left of the results. The store’s innovative filter enables the store to display multiple versions (such as different colors) of the same product. Can I save my search results? In other words, can I save the query and filtration settings of a search that I‘d like to check often? Yes, save the query and filtration settings of any product list by hitting the “Save” button just above the filter in any category or search-results page. Load the results by using the “Load” button to right of the “Save” button.” The “Load” button opens a list of your saved searches. Click the title of any saved search to open it. I can't find the item that I want. How can I search for it? Find the search box on the top of any page. Type in your query, which can include item name, item number, serial number, brand names, categories, specifications and even SKU numbers. Where can I learn more about an item? Browse or search for the product. Then, click on the product’s image to access its product page, where you may read “Details”, “Reviews”, “Shipping & Handling” info and more. There are two ways to place a product into your shopping cart. You may add an item to your cart within its category or within a list of search results. Once you find the product, hover your pointer over the item’s image and click the “Quick Shop” button that appears. A temporary pop-up window will appear with “Add to Cart” button. Alternatively, you may add an item to your cart within its product page. Open a product page by clicking its image, which you’ll find within a category or a list of search results. Then, hit the “Add to Cart” button. If the item is out of stock, you’ll see a “Wait List” button instead of the “Add to Cart” button. Can i save my shopping my cart? What is a Wait List? Why do I see a “Wait List” button where there should be an “Add to Cart” button? The “Wait List” button replaces the “Add to Cart” button when a product is not in stock. When you add an item to your Wait List, the store will automatically email you a reminder that the item is in stock when that occurs, which is when you can purchase the item at your convenience. What is a Wishlist? What can I do with my Wishlists? Wishlists are lists of items that you’d like to buy or are considering buying. Add items to a Wishlist by visiting a product page. Click the “Add to Wishlist” link just above the “Details” section. You may make as many Wishlists as you’d like, and you may share any Wishlist by email. You may also share a Wishlist by giving out your Wishlist's ID number. How can I add an item to one of my Wishlists? Open the item’s product page by clicking its image, which you’ll find within a category or a list of search results. Click the “Add to Wishlist” link, which is above and to the right of the “Details” section. A temporary pop-up window will appear. Select a current Wishlist or type the name of a new list in the blank field. Hit the “Add” button. Can I have multiple Wishlists? How can I share a Wishlist? Click the “Your Account” link at the very top of any page to access the “Account Profile” page. Alternatively, you can skip step three by clicking the “Wishlist” link at the top-right of any page. Click the “Wishlist” button on the navigation menu to the left. Click the title of any Wishlist. Your saved Wishlists appear on a list to the right. In this list, hit the envelope icon on the same line as the Wishlist that you’d like to share. Add the item to your shopping cart by hitting the “Add to Cart” button on the product page of that item. Find and add more items as necessary. When you’re done shopping, hit the “Cart” link at the very top of any page. During checkout, type the redemption code on your gift card in the blank field under “Pay With A Gift Card?” on the same page where you would submit payment details. During checkout, enter the promo code in the blank field under “Do You Have A Promo Code?” on the same page where you would submit payment details. The store uses Secure Sockets Layer (SSL) to encrypt your debit/credit card number, name and address, so only our administrator office is able to decode your information. To be sure your connection is secure, look at the bottom status bar of your browser window. If you see an unbroken key or a closed lock (it depends on your browser), the SSL is active and your information is secure. Most browsers offer additional security alerts. What should I expect after I’ve completed my order? Why is my item on backorder or on a Wait List? The store does not have the item in stock, but it is currently being shipped to the store for your order. How can I order items from my Wishlist? Click the “Wishlist” link at the top of any page. Click the title of any Wishlist to show its contents. Click “Add to Cart” on the same line as the item that you’d like to purchase. When you’re done adding items to your cart, complete the order by hitting the “Checkout” button in your cart. Check the status of any order on the “Order History” page of "Your Account". Alternatively, contact customer service. Click the “Customer Service” tab on the navigation bar towards the top of any page. Click the “Contact us” link under the “Company Info” section. We will contact you shortly with a solution to the problem. Click the “Your Account” link at the top of any page, or click the "Customer Service" navigation tab. Click the “Order History” button/link. Submit your order number and zip code into the blanks. Click the “Your Account” link at the top of any page. Make sure that we have your address saved by checking your “Address Book.” Get there via the navigation menu to the left. Click the “Cart” button at the top of any page. Edit your shipping information under “Shipping Information” on the “Secure Checkout” page. Submit the correct shipping address, including country, before completing the checkout process. Yes, but the item must be defective or in brand new condition. You sent me the wrong item. What now? This rarely happens, so we’re very sorry. We’ll fix the issue at no cost to you. Start by clicking the “Customer Service” tab on the store’s top navigation bar. My item got damaged during shipping, or my order arrived with missing items. What should I do? This rarely happens, so we’re very sorry. We’ll work with you to fix the problem at no cost to you. First, document any and all damage to the package and product with photography and descriptive text both prior to and after opening the package. Record as much information as possible about every detail, including the information of the shipping company’s driver. Next, click the “Customer Service” tab on the store’s top navigation bar.